Helvellyn consulting offers business consultancy, bespoke web design and website maintenance to individuals and businesses in Cumbria and elsewhere. We also specialise in search engine optimisation, focusing on ensuring your site gains maximum exposure in the areas that matter most for your business. For an overview of our range of services please click here, or click on the links below for specific services. Alternatively for more information please contact us. The How Holiday Cottage in Patterdale. 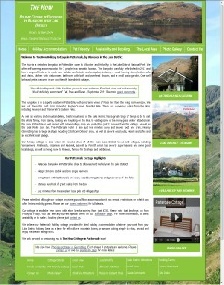 Website for a new holiday cottage in Patterdale which sleeps 3 people and is pet friendly. Simple website but with comprehensive information on the accommodation, use of embedded videos, flash slideshows for pictures, google maps and social media links, as well as embedded availability calendar. Went live in September 2011. Home Farm bed and breakfast in Patterdale. Revamp of an existing website that needed updating with better layout, graphics and search engine optimisation. Went live in June 2011. 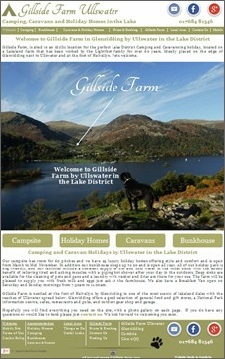 Fellview Holidays offers holiday cottages on the border of Glenridding and Patterdale by Ullswater. The owner wanted a very quick rewrite of an existing site to bring it more up to date and to make it more easy to edit and keep it maintained. The work too less than 2 days and we went live with the new site in March 2012. Crookabeck Farm Shop in Patterdale sells Angora Mohair and Helvellyn Herdwick wool products both in their shop and online. The website was over 10 years old and needed a complete rewrite, including an update on the online shopping facility. 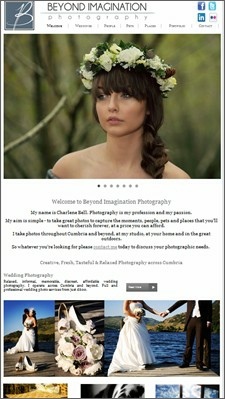 Thanks to some fantastic photographs from beyond imagination photography the new stylish site has been a great success. The site went live in March 2012. 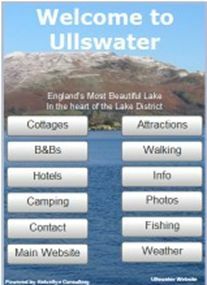 The Ullswater Mobile Site was created in March 2012 to feed the growing demand for mobile friendly information on England’s most beautiful Lake District lake. 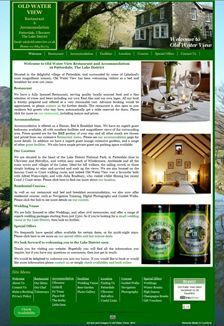 Designed to complement the existing extensive main Ullswater website, the simple site has all the key information on accommodation, attractions around Ullswater as well as information, photos and weather reports. The site is compatible with most mobile devices. 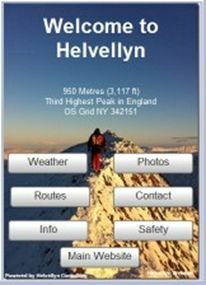 The Helvellyn Mobile Site was also created in March 2012 to allow userson the move to access key information on Helvellyn, with wether reports, photos, route and safety information, as well as a link to the main Helvellyn site. Beyond Imagination Photography offers professional photography in Cumbria. Charlene Bell who runs the company takes superb and affordable photos for weddings, events, parties and also portraits of adults, children, toddlers and babies. She also specialises in pet photography, as well as offering boudoir photos from her studio in Patterdale. With Charlene’s superb photos as well as her own design for the background, we were able to create a stunning site to showcase her talents. The website went live in May 2012. Old Water View Restaurant and Accommodation in Patterdale has been offering bed and breakfast accommodation for over 100 years. At the start of 2012 they opened a new restaurant offering fresh and affordable home cooked meals to residents and non residents. They were looking for a new site to showcase both the new restaurant and the fantastic accommodation, based around their new colour scheme. Working with professional website photos taken by Charlene Bell from Beyond Imagination Photography we were able to create a new site which ably reflects the quality and style of the revamped Old Water View. Went live in May 2012. 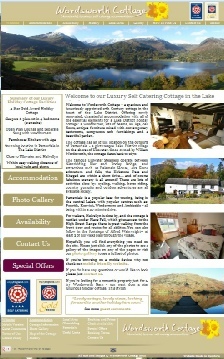 Wordsworth Cottage and Wordsworth Barn offer luxurious gold award winning self catering in Patterdale. 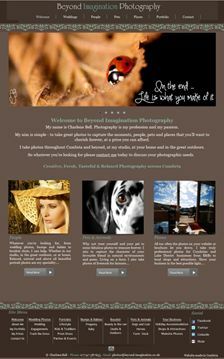 The owner was after an update to her websites with a fresh look and feel and some new photos. After a shoot from Beyond Imagination Photography’s Charlene Bell I was able to update the sites with some great new photos as well as create new mobile compatible versions of the sites. The websites went live in December 2012. 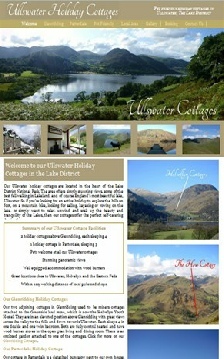 The Ullswater Cottages website is a showcase for 3 holiday cottages around Patterdale and Glenridding in the Lake District. As well as easy navigation and good use of photo galleries I also created a mobile and ipad version of the site. The website went live in October 2012. 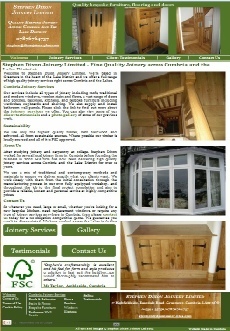 Stephen Dixon Joinery Limited. Stephen offers a range of high quality joinery and carpentry services around Cumbria and the Lake District. He is based in Grasmere but operates across the Lakes. He was looking for a simple website to showcase his talents and so I created an easy to navigate site with plenty of photos of his work and with pages for each of the joinery services he offers. The key was the web optimisation for search engines for his relevant key phrases. The site went live in January 2013. High Becksidde Cottage in the Lake District. High Beckside is a pet friendly family holiday cottage in a superb location in Hartsop, near Patterdale and Ullswater in the Lake District. It sleeps 7 and has superb facilities and views. The owners were looking to market the property themselves having run it through an agency for many years and wanted a good website to highlight the benefits of the property. We designed a straightforward web and mobile friendly site which hopefully fits the bill. The site went live at the end of 2012. 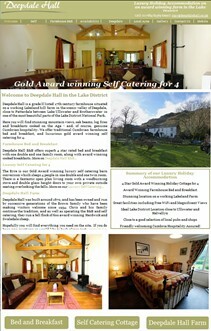 Deepdale Hall is a local Lakeland Farm in Patterdale offering luxury bed and breakfast and gold award winning self catering in a stunning location close to Brotherswater and Ullswater. Chris was looking for a revamp of his existing website which had been designed nearly 10 years ago. Using some great photos from Beyond Imagination Photography we designed a new site including a mobile version which made the most of the wonderful facilities and setting offered by Deepdale Hall. The site went live in March 2013. St Patricks Church Patterdale. 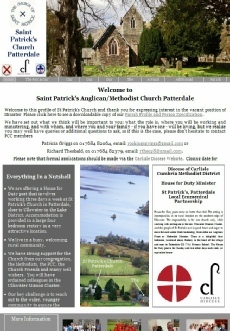 As part of their search for a new minister St Patrick’s Church in Patterdale were looking to advertise the post online, with use of good photos and easy navigation around the site. The resulting website was quickly built from the Parish Profile and provides an easy to use site which will serve the Church in the future. The site went live in May 2013. Patterdale Church of England Primary School were looking for a new website to bring them in line with current Ofsted and Government requirements. They also wanted something that would a fun and useful resource for the children and their parents. The resulting site combines some stunning photos from Beyond Imagination Photography with good web design and useful content. The site went live in 2013. 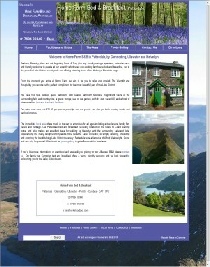 Natural at Heart Holistic Therapy in the Lake District. Hazel offers a range of therapies and treatments from Crookabeck Farm in Patterdale. 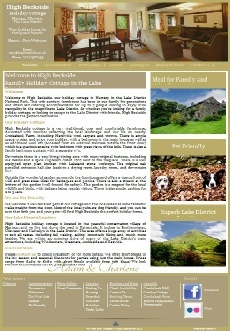 This was a new business appealing to both walkers and holiday makers staying around Ullswater. The site aims to showcase Hazel’s work and the project also included extensive linking and adverts on other sites to ensure maximum exposure. The site went live in 2014. 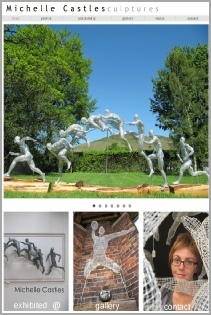 We were honoured to be asked to create a website for renowned wire sculpture artist and sculptor Michelle Castles, whose studio is in Cumbria. She wanted an elegant, clean, modern site that showcased her magnificent work. After extensive consultation we were able to develop a website which we hope reflects her artistry and skill. We also worked with her on various promotional brochures. 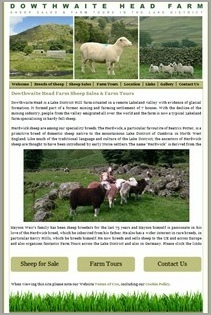 We were asked to take over the maintenance of the website for Mayson Weir who runs Dowthwaite Head Farm in the Lake District. In addition to revamping the website to make it mobile and tablet friendly we also worked with Mayson to expand the content of the site to cover a wide range of the Rare Breed Sheep that he rears and sells across the UK and Europe. In addition we worked with Mayson to help him develop his Farm Tours business, both in the UK and Germany. Kittyhouse Farm offers 2 wonderful self catering holiday cottages close to Ullswater in the Lake District. They were looking to update their website with some new photos and an easier navigation to make it multi-platform compatible. 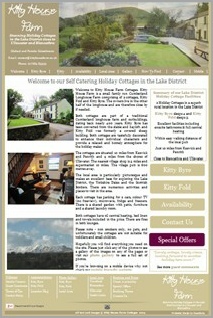 They also wanted a blog so they could update special offers and news for the cottages. We devised a clean and contemporary design which was delivered within a week. As part of the 100th Anniversary Commemoration of the start of the World War One we were asked to produce a website to commemorate the men from Patterdale and Glenridding who fought and tragically for some died, in WWI. The project is ongoing to try and research the lives of all the 100 men who are listed on the Glenridding Village Hall Roll of Honour. To find out more please visit the Ullswater Memorial website. The site went live in July 2014. Keepers Cottage Ullswater is a great pet friendly holiday cottage for 2 people on the border of Glenridding and Patterdale. They were after a quick website to replace their existing site which was outdated. 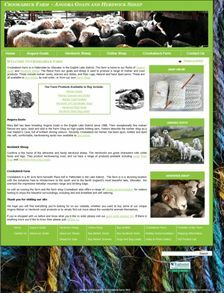 What they got in the space of a week was a stylish contemporary site which is mobile and tablet ready. The Glenridding Hotel Ullswater is a family run hotel in the Lake District with 36 stunning ensuite bedrooms and a host of great facilities including an indoor heated swimming pool and sauna. They were looking for a new website which was mobile and tablet friendly which would make the most of the photo portfolio they had recently commissioned, as well as making sure the hotel (under a new domain name) performed well in the search engines as quickly as possible. 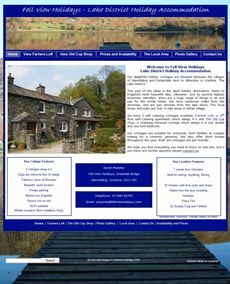 The noziphere.org website was produced for a local campaign aiming to stop the proposed installation of 4 parallel mile long zip wires above the tranquil village of Glenridding next to Ullswater in the Lake District National Park. As well the obvious thing the campaign needed a simple design that could be navigated from multiple devices and included an interactive twitter feed based on #noziphere. The site went live in November 2014 and the fight continues. Please click the image to the left to visit the site and sign the online petition against the ridiculous proposals. 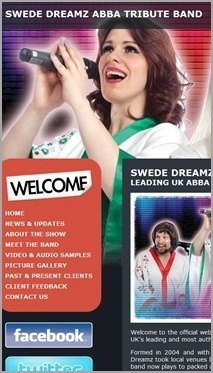 Swede Dreamz are one of the best Abba Tribute Bands operating in the UK today. They are based in Cumbria but operate across the UK. They were looking for some assistance with their Search Engine Optimisation including a review of their “on page” website to ensure it was properly optimised and also looking at their presence “off page” on the rest of the web including social media. We did a quick review of their site and web presence and recommended some straightforward steps to improve their search engine rankings. Beyond Imagination Photography offers a range of professional photography across Cumbria and the North West of England, including wedding photography. Charlene wanted to rebrand her business and update the website with her new portfolio of fantastic photos. With a new colour scheme to compliment her logo and using nivo sliders to showcase her beautiful photos, the site we relaunched in 2015. 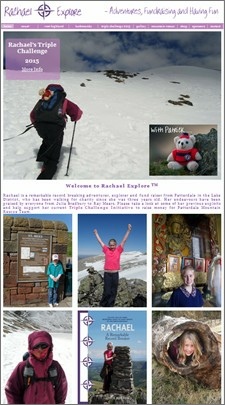 Rachael is remarkable young lady who has already completed a number of long distance walks and adventures, all to raise money for the Patterdale Mountain Rescue team. She even has her own Rachael Explore Clothing Range. To promote her latest Triple Challenge, which includes walks in Iceland, Nepal and the UK, her father wanted a website to showcase her achievements and allow people to donate to her chosen causes. The site was launched in 2015. Gillside Camping and Caravan Park in Glenridding by Ullswater is surely one of the most beautifully sited campsites in the Lake District. They wanted a modern update for their website with full mobile compatibility, as well as a set of new photos to refresh the site. The site went live in 2015. Catherine lives in the Lake District and writes poetry inspired by her surroundings. 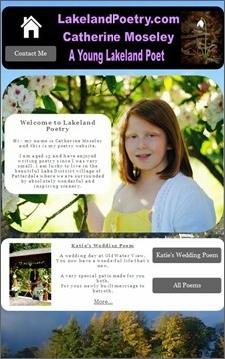 Her father wanted to showcase her poetry and we created the lakelandpoetry.co.uk website for her. The site launched in 2015. 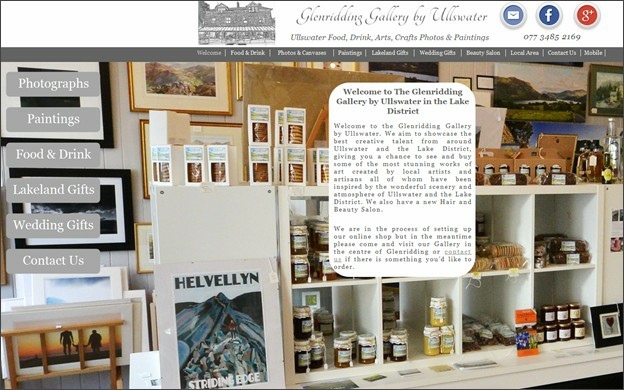 The Glenridding Gallery by Ullswater showcases the best creative talent from around Ullswater and the Lake District, giving you a chance to see and buy some of the most stunning works of art created by local artists and artisans all of whom have been inspired by the wonderful scenery and atmosphere of Ullswater and the Lake District. The gallery opened in 2015 and were looking for a website to highlight the many wonderful products on offer with a view to offering online shopping as well as an informational site to attract customers. We built a fully mobile responsive site to meet their needs.